When the weather starts to get warmer, spring fever sets in and you might be thinking about getting away. There are lots of places to go for a summer getaway, and the offerings include diverse attractions and categories. But once you decide on a destination it’s time to start preparing your vacation looks. Many popular destinations have their own unique personality and style that can be embodied through clothing. Here are a few ways to capture the spirit of the top destinations with the contents of your suitcase. According to The Desert Sun, Palm Springs is the “new capital of cool,” boasting everything from beaches to hiking trails. Like all vacation locales, the weather is going to be warm so be sure to pack a swimsuit. If you want to blend into the California scenery, however, you may want to try out a some bold floral brings to get into the California spirit. 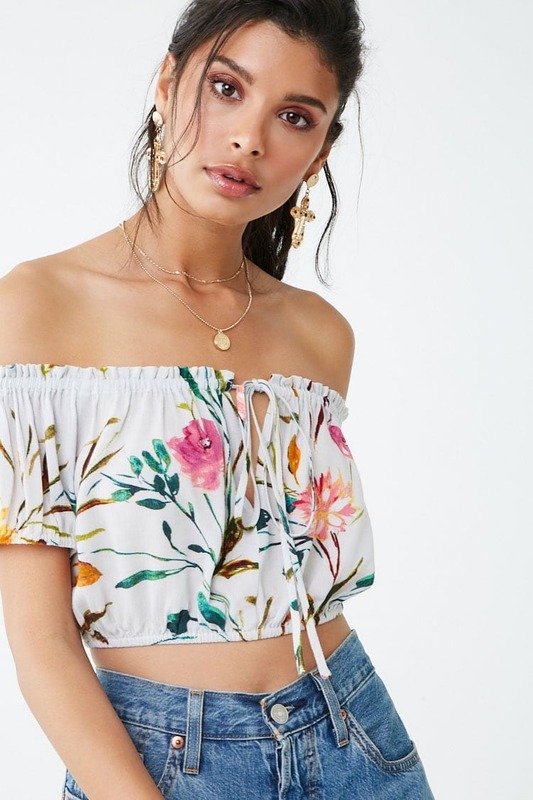 We can’t get enough of the understated, yet fun pattern of floral pieces like the Tropical Print Top or the Off-the-Shoulder Floral Print Crop Top. Either looks great paired with your favorite shorts. Cancun is the number one summer destination for young people. Why wouldn’t it be? There are beautiful white-sand beaches, cost-effective resorts, golfing, and nightlife. Planning a trip to this beautiful Mexican beach means that you have to plan for hot weather and layers. Focus your packing on beach-type attire like flowy tops, and comfortable skirts. You are likely to find that most people wear beach-type attire everywhere, even in nighttime establishments. Some items you might consider packing are an Embroidered Floral Kimono. The perfect light layer for the beach. If you’re more inclined for the nightlife aspect of Cancun try the Iridescent Mini Skirt for a fun and fresh nightlife look. On the southernmost tip of Baja California is Cabo San Lucas, a vacation spot known for its decadence. This location used to be the prime vacation spot of Hollywood’s elite in the 1970s, providing a haven away from the show biz lifestyle. In the last forty years, the elitist atmosphere has dwindled, but that doesn’t mean the luxury isn’t there. What to Pack for Summer Vacation? When preparing for your trip make sure to include your favorite floral maxi dresses as well as your favorite bikini. During the day, tourists and co-eds can go around in their standard beachwear, but a dressy casual attire is preferred during the dinner hour or at nightclubs. An essential we’d recommend is the South Beach London Sarong Swim Cover-up. It’s a festive and colorful piece that’s fun to wear and is sure to keep you looking styles. For floral dresses, we especially love the Striped Floral Maxi Dress and the Strappy Floral Maxi Dress. For those craving the nightlife, the Bahamas might be more your speed. This island chain is made up of hundreds of islands that are known for both their white sand beaches and a roaring nightlife. Nassau, one of the islands, even boasts a thriving casino. If you plan on paying a visit to the casino, you may be surprised to find that the dress code is a little more casual than you’d expect. For that reason, consider packing layers that go easily over your bathing suit. A gorgeous sarong or a sun dress are the perfect places to start. For a look that can transition seamlessly, try a South Beach London Kaftan Swim Coverup. Add a stylish belt and cinch it at the waist to complete the look. Miami Beach is a city with a hopping social calendar that enjoys gorgeous weather all year round. You’ll want to be sure you’re prepared to check out the hottest nightlife in the area. Pack your summer fashion that features your brightest colors and outfits that make you feel like doing a little dance. Still want to get in a little time at the beach? Be sure to pack a swimsuit because the wide shores are the perfect place to soak up some rays. We recommend the Textured Floral Cage-Trimmed Bathing Suit or the South Beach London Plunging Patterblock Swimsuit. Summer is about having fun, and there’s no reason that shouldn’t extend to your wardrobe as well. Don’t be afraid to experiment and have fun. If you’re really stuck, try giving your summer fashion wardrobe an update at FOREVER 21 to find a brand new bathing suit or some lightweight beachwear. That way when you finally relax into your vacation, you’ll also look fabulous doing it.